BANGKOK, 8 August 2011 – Pheu Thai party-listed MP Yingluck Shinawatra has been royally endorsed the 28th prime minister of Thailand. She has pledged to work with fullest effort and devotion for the sake of the nation and the Thai people. Speaking after the royal endorsement ceremony at the Pheu Thai Party headquarters on Monday evening, Ms Yingluck gave a press conference that the royal endorsement was the greatest honour for her to serve the monarch, the nation and people. The newly endorsed prime minister expressed her gratitude for this occasion. She then encouraged people to join the celebration arrangement for the 84th birthday anniversary of His Majesty King Bhumibol Adulyadej and the 79th birthday anniversary of Her Majesty Queen Sirikit. Ms Yingluck expressed her thanks towards Pheu Thai party members and MPs for granting her this opportunity to be the new prime minister of Thailand. She also asked for supports from all sides to help her moving the country out of the crisis. The first female prime minister pledged that she would do her best with honesty and devote herself to the nation, lead the country towards peace and reconciliation as well as solve problems for the people. 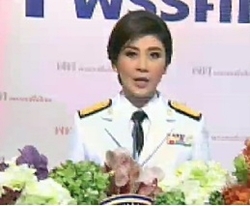 She voiced her readiness to work with all sides to return happiness to all Thai citizens. Ms Yingluck lastly thanked the Thai people to give her this chance to work as the new prime minister as she regarded it as a commitment she had with the Thai people to create happiness and mitigate sufferings of people. She promised that she would not work for particular groups but for everyone. Previous articleShooting at Police can often backfire.